Small businesses plan to create SEO strategies in 2019, indicating that they are adapting to shifts in consumer search and purchasing behavior. Most of these small businesses also opt to invest in PPC advertising. SEO is crucial for small businesses: Increasingly, interactions between businesses and customers occur through search. We surveyed 529 small business owners and managers about their approach to SEO and pay-per-click (PPC) advertising. We define small businesses as having between 1 and 500 employees and limited revenue, which corresponds to the Small Business Administration’s definition of small business. We found that small businesses intend to have an SEO strategy in place either in 2019 or in the future and depend on in-house staff to execute their SEO strategies. Small businesses also heavily invest in PPC and recognize the importance of content marketing and voice search for search marketing. Small businesses can use this report to adapt to search marketing trends and be competitive in the digital landscape. More than one-third (36%) of small businesses have an SEO strategy. 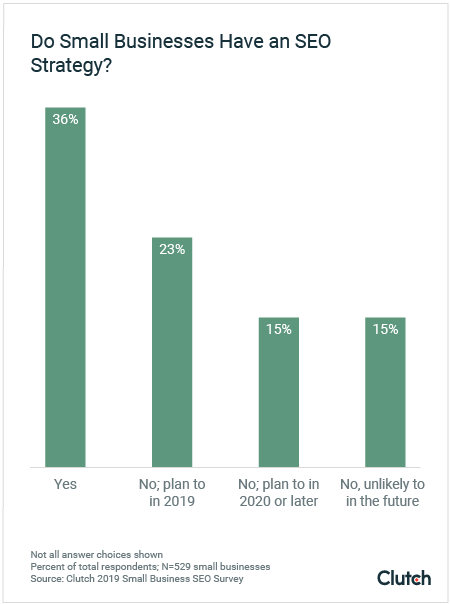 An additional 23% plan to have an SEO strategy in 2019. Social media marketing (63%) is the most common SEO effort for small businesses, followed by a mobile-friendly website (54%) and keyword research (51%). Nearly half of small businesses (48%) invest in content marketing for SEO, an increase of 16% from 2018. More than half of small businesses (54%) depend on in-house staff for SEO services, nearly double the number that hire an SEO agency (28%). Traffic from search engines (25%) is the primary metric small businesses track to determine the success of their SEO strategies, followed by leads and conversions (19%) and backlinks (14%). Sixty percent (60%) of small businesses with SEO strategies also invest in PPC advertising, an increase of 15% from 2018. An additional 17% plan to invest in PPC in 2019. Small businesses increasingly map out and execute SEO strategies. 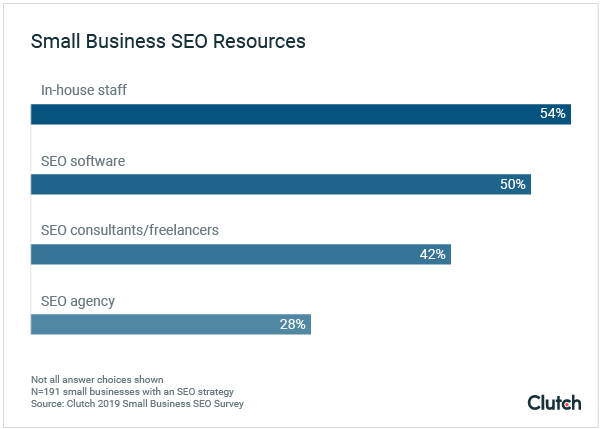 More than one-third of small businesses (36%) already had an SEO strategy going into 2019. 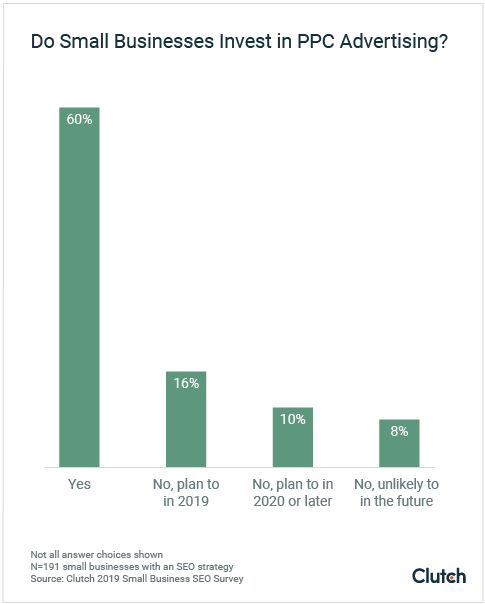 An additional 38% plan to have an SEO strategy in 2019 or later. This indicates that small businesses are beginning to recognize the value of investing in SEO. People increasingly use search engines when researching a product to purchase. Small businesses need an SEO strategy to earn visibility in search results and attract more customers. “Simply waiting for users to come and buy doesn’t work, online or off,” said Natalia Makarenko, SEO specialist for CIENCE, a business-to-business (B2B) lead generation company in San Diego. Engaging with people who use search as a resource for online purchasing is one motivation for small businesses to implement SEO strategies in the future. 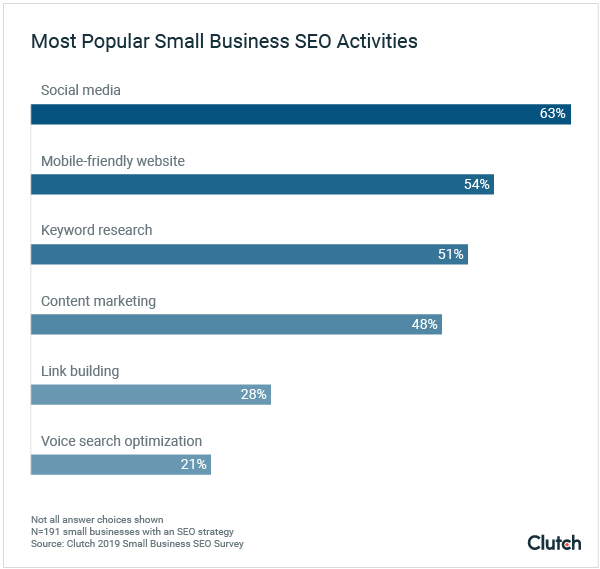 A growing number of small businesses invest in content marketing and voice search optimization for SEO, though social media remains their primary SEO effort. Nearly two-thirds of small businesses (63%) invest in social media marketing for SEO. This is somewhat surprising. Social media and SEO have a strong correlation, but there is little data to suggest that social media directly impacts search rankings. After social media marketing, having a mobile-friendly website (56%) and performing keyword research (51%) are the second- and third- most popular SEO activities for small businesses. Mobile-friendly websites play an important role in a website’s search ranking. In 2018, Google instituted mobile-first indexing, which considers a website’s mobile version, rather than its desktop version, for indexing and ranking content. If your company website is not mobile-friendly, your search ranking is negatively affected. “Ensuring that a website is optimized for mobile goes beyond design and usability....It ensures your site ranks highly on mobile search results,” said Greg Dorban, chief strategy officer for Ledger Bennett, a B2B marketing company in London. Small businesses that invest in mobile-friendly websites are optimizing their sites for strong search rankings. The number of small businesses that create high-quality content for SEO increased 16% from 2018. This commitment to creating content indicates that small businesses understand the value of content marketing for SEO. People use online content to research and vet products and services before they make a purchasing decision. For example, when someone searches "best drone accessories," the content that interests her likely lists or examines different drone accessory options. This interest is reflected in the top results that appear for this term. 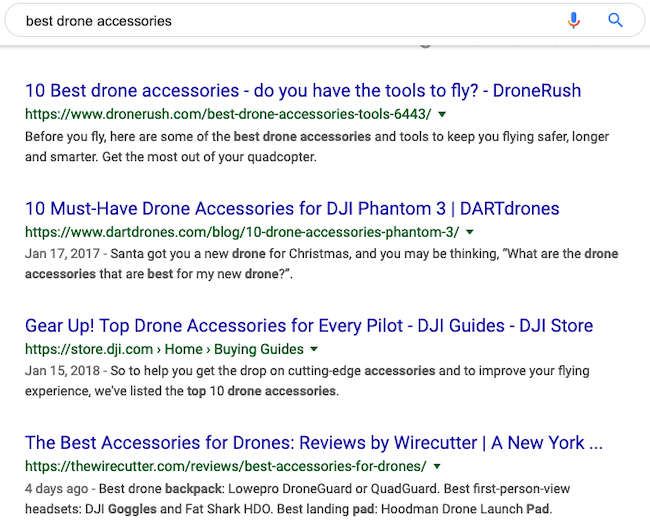 "Best drone accessories" is not a search term targeted at learning about drones in general or where to purchase drone accessories. Content that focuses on those topics will not rank for this term. Small businesses that produce content that corresponds to the terms people search for when preparing to buy can lead potential customers to their products and help them make an informed buying decision. The value of producing online content that answers people’s search queries is even more important with the rise in voice search. Andrew Ngu, former chief scientist at Baidu, a Chinese technology company and search engine, predicted that by 2020, 50% of all searches would be conducted through voice. While too much credence may be given to this claim, voice search will undoubtedly increase as people rely on artificial intelligence and virtual assistants such as Amazon’s Alexa to accomplish tasks and access information. When people use voice search, they expect their voice assistants to understand context. For example, understanding that the question, “Where can I find food?” is about restaurants, rather than grocery stores. 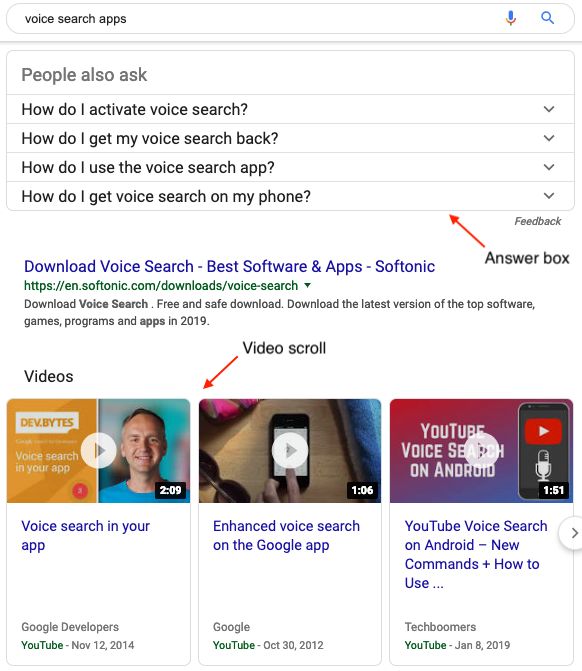 Optimizing content for voice searches requires focusing on user intent – the implied context in a person’s search query. Content that’s optimized for user intent has a better chance of being pulled in response to a voice search. As people shift how they search and shop online, it’s important for small businesses to understand how to use content marketing to guide people through their purchasing decisions and create content that's optimized for voice search. Small businesses depend on in-house employees to plan, manage, and execute their SEO strategies. Over half of small businesses that invest in SEO (54%) rely on in-house teams for SEO services. Half (50%) use SEO software such as SEMrush or Moz. Fewer small businesses rely on experts to ideate and execute their SEO strategies. Forty-two percent (42%) hire an SEO consultant or freelancer, and 28% use an SEO agency. In-house employees for SEO appeal to small businesses for two main reasons: cost and control. The cost of SEO companies often includes a base retainer fee and charges for other services provided, which often makes hiring an SEO agency unaffordable for small businesses with limited budgets. Jaykishan Panchal manages SEO strategy for E2M, a digital marketing company in San Diego. He attributes the preference for in-house employees to the amount of control it allows small businesses to maintain over their SEO activities. The combination of control and cost make having an in-house SEO team appealing for small businesses. The value of having in-house staff perform SEO services, though, should be weighed against time they could spend on other firm-building activities and the industry experience of an SEO agency. “It’s always a trade-off. Agencies can bring a wealth of experience from other clients and leverage their relationships to accelerate SEO performance,” Dorban said. Using in-house resources for SEO tethers your success to the time your staff spends on SEO and their understanding of best practices. Agencies, on the other hand, help small businesses develop a holistic SEO strategy. It’s critical for small businesses to consider if it’s more valuable to hire an SEO company, which has industry experience, understands best practices, and maintains an SEO strategy over time. The metrics small businesses use to determine SEO success reflect their SEO objectives: increasing website traffic and earning money. Traffic from search engines (25%) is the primary SEO metric small businesses track, followed by leads and conversions (19%) and backlinks (14%). The top SEO metrics small businesses track reflect their main business goal: boosting revenue. SEO is tied to earning more revenue because the first step toward converting a customer online is to get him on your website. Measuring how many people come to your website from search clarifies whether SEO facilitates business opportunities. Measuring leads and conversions, on the other hand, helps determine the quality of the traffic that small businesses earn through SEO. High-quality leads are most likely to convert to paying customers. By tracking which leads from SEO actually convert, small businesses measure the impact their SEO have on revenue. While search engines weigh metrics such as website traffic and backlinks when ranking pages, small businesses should consider the quality of these metrics to determine SEO success. The top SEO metrics small businesses track could be described as vanity metrics, or metrics that don’t provide the full context about whether SEO efforts are effective. "You can have a lot of traffic but is it relevant? Does it convert?" said Garry Grant, chief executive officer of SEO Inc., an SEO company in California. "There’re so many other factors." Small businesses should track the three metrics above in addition to metrics they already track – pageviews, leads, and backlinks. Pay-per-click advertising is important for visibility on search engine results pages (SERPs). Small businesses recognize this trend and invest in PPC. Sixty percent (60%) of small businesses with an SEO strategy also invest in PPC advertising, an increase of 16% from 2018. An additional 17% of small businesses plan to invest in PPC in 2019, and only 8% are certain that they won’t invest in PPC. Investing in PPC advertising helps your business appear “above the fold” for mobile search – meaning your listing is the first content people encounter when they search on a mobile device. Mobile searches are more common than desktop searches. When people search on mobile, their screen naturally displays less information than a desktop. As a result, users have to scroll to reach organic results on mobile devices. Showing up above organic results for mobile searches provides brand awareness for small businesses. "Google loves to fill information up on that first page," Grant said. "Getting first page results is getting increasingly difficult. It depends on what you are searching for, but the first page shows Google Ad’s above the fold, followed by big brands including Amazon, images, definitions, and videos." Investing in PPC makes small businesses more certain that they can achieve some visibility for target keywords in condensed and competitive SERP space. PPC provides direct return on investment that small businesses can measure, which makes it appealing as an investment, especially as organic opportunities condense. PPC advertising is costly for small businesses that invest regularly. Small businesses can use their paid search efforts to inform their SEO strategy so they don’t have to rely on PPC only to earn visibility in SERPs. While the space for organic results on search may be condensing, strong organic rankings are still incredibly valuable. The top 5 organic results earn approximately 60% of clicks on a search results page. Content: Produce content on your website that uses the terms and tone from the paid search ads that people clicked on the most. Meta Tags: Use titles and descriptions you created for your top-performing PPC ads in your site content. Keyword Targets: Determine which keywords earned the most engagement in your PPC campaigns and incorporate the top-performers in content on your website. Using data from PPC advertising may help small businesses optimize their website and achieve search marketing success on a budget. 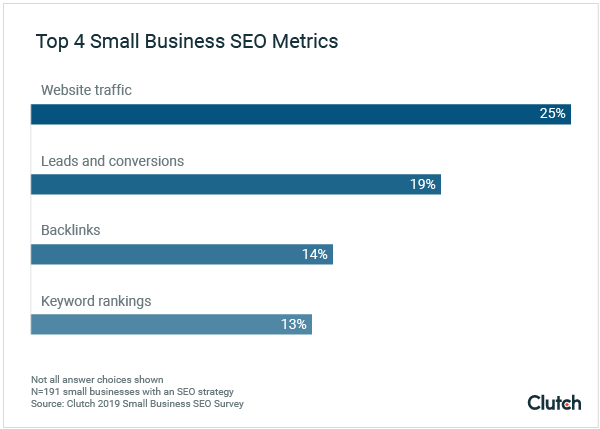 Nearly 40% of small businesses have an SEO strategy in 2019, a number that is expected to increase in the future as small businesses recognize the value of SEO for engaging online customers. The SEO activities small businesses include as part of their SEO strategies – mobile-friendly websites, content marketing, and voice search – indicate that they are adapting to shifts in how search engines index web content and how people search online. The in-house employees most small businesses depend on for SEO services provide cost and control benefits. Hiring an SEO agency, however, would allow small businesses more time to focus on firm-building activities and experts to design and execute an SEO strategy. To measure the success of their SEO strategies, small businesses collect data about website traffic and leads and conversions – metrics they need to review with context to understand their impact on SEO. Small businesses also invest in PPC advertising to earn visibility on mobile search results and to adapt to condensing search engines results pages. To experience the benefits of organic and paid search marketing, small businesses should use their PPC ad data to inform their organic SEO. Clutch surveyed 529 small business owners and managers about their SEO and PPC strategies. More than half of small businesses (54%) surveyed have between 1-10 employees; 24% have 11-50 employees; 22% have more than 50 employees. Fifty-two percent (52%) of respondents are male, and 48% are female.